I had such a great day trip to Manual Antonio (Mani Toni as some like to call it) from my hostel Room2Board in Jaco. 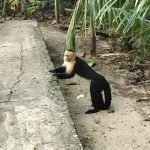 You start the trip with an hour and 15 minute bus ride from Jaco to Quepos where you will then get onto a bus to Manuel Antonio, which will take about 10 minutes. You’ll be dropped off in front of the beach in town where you will walk to the entrance of the park from. It will cost $16 to enter the park but it’s completely worth it, especially if you get to the park early! Once you enter, you can walk through colorful plants and flowers, massive and beautiful trees, and hopefully see some sleeping sloths in the trees. Keep walking through the marked paths and you’ll find yourself walking up to a white sand beach with clear, blue water. 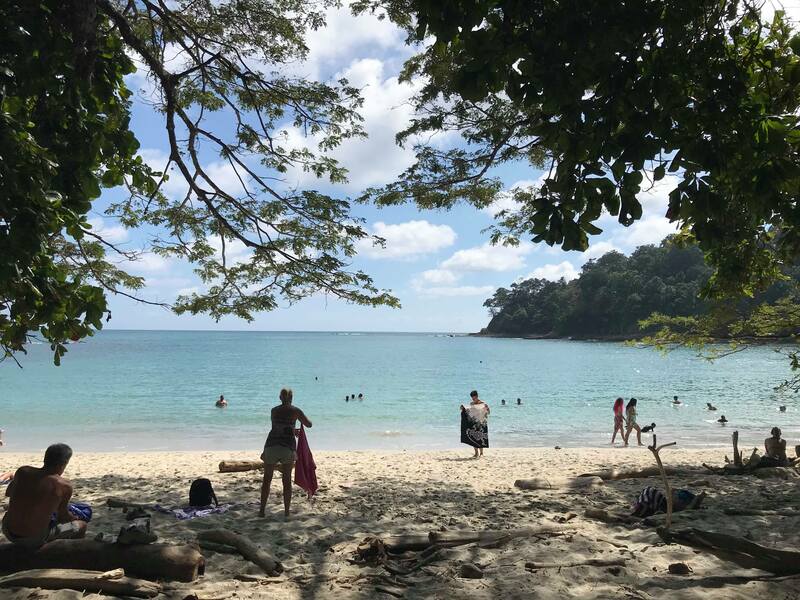 The best thing you’ll find is curious monkeys jumping through the trees, observing the humans as they swim and sunbathe. I was lucky enough to see a sleeping baby on the back of its mama. Also on this beach you’ll find families of raccoons that like to adventure into bags and coolers so be careful of food that you bring into the park, if the park agents will even let you bring it in! Sunbathing on these beaches and swimming in the ocean was so relaxing compared to past beaches I’ve visited. It was nice and secluded at the back of the park, with showers and bathrooms available to rinse off at as well. There are multiple beaches to choose from, some more secluded than others, with a viewpoint tower between two of them. I even spotted some sunbathing iguanas and crabs buried in the jungle floors as well. If you’re needing a nice day off with family or friends, this is the place to be. Manual Antonio is a great day trip from Jaco. 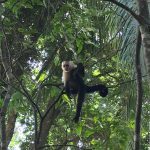 It was a much needed break for me and allowed me to see more of Costa Rica outside of Jaco. 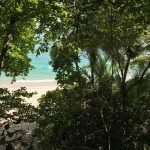 It was fun to walk around Quepos for 45 minutes because the town is much smaller than most that I’ve visited, showing me a more rural take on Costa Rican life. It was a great day to say the least, and I would highly recommend adding it to your list of places to visit! This blog was written by one of Room2Boards volunteers, Amanda Klopcic.